My Soccer Blog: Future home of St. Louis MLS team? St. Louis has always been a hotbed for soccer in the US, but MLS has not been able to place a team in the area. It, along with Philadelphia and Seattle, always seems to come up whenever expansion teams are discussed, only to miss out. However, it looks like the area could be one step closer to finally getting a team thanks, in part, to the city of Collinsville, Illinois, and an amphitheater that was never built. Collinsville is about 15-miles from downtown St. Louis, Missouri and on Monday the mayor confirmed that the city is negotiating with private investors to bring a MLS club to town. Their desire is to build a stadium at the location of a now defunct amphitheater project (see red arrow on map for the location). The site is located right next to Interstate 255 and was created as a tax increment-financing district in 2002. Basically the city has been looking to build something at this location for 5-years but has not been able to make it happen. If this all gels, the future stadium would be very similar to those of other MLS clubs. It would have a stage for concerts, seat around 20,000 and host other non-soccer events through out the year. This sounds like wonderful news, but if it happens I've got to wonder, what is wrong with Missouri as both the Kansas City and St. Louis teams would end up playing outside the state (that is if Kansas City ever actually finds a home)? I think it has to do w/ available land. Almost all land in st. louis metro area has been developed or will not accomodate a stadium. I would be all for this. I am fed up with insane ticket prices for baseball and football, hockey. STL has always been a soccer town, I think this would succeed here. I hope it happens. Good point about STL being so developed. I hope it does happen as STL has a great soccer history and is just a fun town in general. Also, the rivalries with Chicago and Kansas City would be fantastic for the league. I agree completely with the above comments. St. Louis is a huge soccer city and the rivalries with chicago and kc would be awesome. I for one would buy season tickets. What are your reactions about the Beckham deal? It's been a very long time coming. Even down here in Cape Girardeau people have been wondering when St. Louis was going to get an MLS soccer team. I think it will be met with open arms. I'm on the edge of my seat. I can't wait to see David Beckham play soccer in our neck of the woods. I saw Brian McBride play at the Busch soccer complex, but nothing compares to actually having a team to go see regularly. The first anonymus is completely incorrect about St. Louis being too developed to house a new stadium. One could easily be put in the nearly vacant St. Louis Marketplace (Manchester between Hampton and McCausland), on South Kingshighway between Delor and Devonshire, in the old vacant Venture store in Maplewood (not St. Louis, but only 1/2 a mile west), and various locales north of Washington. Putting a stadium in Collinsville would be a joke. I'm sure there are quite a few folks on the eastside who would go to games, and maybe some from the Missouri side of the river as well, but placing a team in relatively sparsely populated, relatively inaccessible area is a poor idea. The only reason anyone would ever build there is because of a sweetheart stadium deal, which is a very shortsighted reason. Collinsville will be a huge failure. People from St. Louis and St. Louis County will never cross the river for anything. 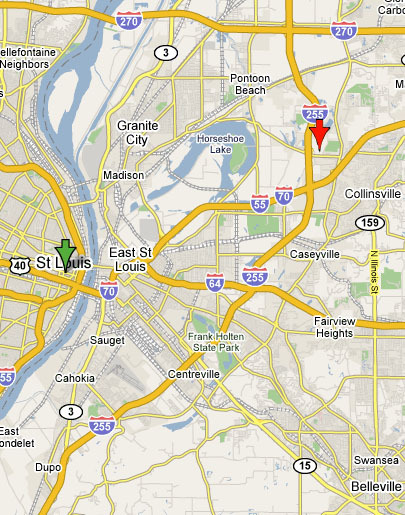 In the eyes of most St. Louisans, the "east side" represents horse racing, strip clubs and casinos. Soccer will be a hard sell in St. Louis as it is, and locating in on the east side would guarantee failure. St. Louis is an AMATEUR soccer hotbed, but the numbers of kids who play soccer does not equate into people who will spend money to attend games, much less drive 15-30 miles (depending on where they are located) to do so. Where in St. Louis will they be able to fit a stadium plus all the extra facilities that goes with the MLS version of a soccer stadium. Look at Colorado's stadium. It is a whole complex with many soccer fields. If in collinsville you could have a stadium, youth facilities, adequate parking and room to expand. I hate that it would be way outside the STL but where else around stl can all that stuff fit? I think it's crazy to think that the MLS team would be a failure if located in Collinsville. How many of you doubters have driven to Collinsville? 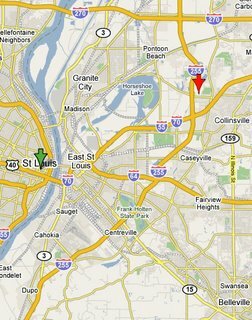 It takes 12 minutes to get from Busch Stadium to the proposed location in Collinsville. I think it would be great to see something (FOR ONCE) land on the IL side of things. I hope they get it. STL will NOT get a team cause the MLS knows very well Missourians fears about leaving the safety of the second most dangerous city in the US to cross into another state. And you wonder why St. Louis never grew like Chicago. Most outstate Missourians are afraid of STL and most STL residents are afraid of change/IL. NASCAR see's this thats why there is NO Nextel Cup race at Gateway, cause the STL cannot sell out a Busch race there. They (MLS) know there will be no sudden shift in MO attitude towards change, so dont get your hopes up too high that a team lands in Collinsville! To my fellow MO residents, get over your aversion to explore new places and ideas, its very enlightening, if you look inward you will truly see how backward we are.